The Red Door Inc. and the Economic Development Committee of the Shelby County (TN) Alumnae Chapter of Delta Sigma Theta Sorority, Inc., will host a Housing Workshop to educate and provide resources to buyers and sellers about today’s housing market. Guest presenter will by Mr. Leon Dickson Sr., President of the Association of Tennessee Realtors. Come out and celebrate Veteran’s Day with us by getting valuable information on the housing market. This event is free and open to the public. Register today! IF YOU CAN SAVE $1,000, WE WILL MATCH YOUR SAVINGS WITH AN ADDITIONAL $2,000 TO HELP YOU PURCHASE A HOME, COMPUTER, OPEN A SMALL BUSINESS OR FURTHER YOUR EDUCATION. You may qualify if you are employed and on Section 8 through MHA, or if you are employed and eligible to file for Earned Income Tax Credits. You must meet RISE qualification guidelines. CALL (901) 507-8884 to RSVP AND (901) 507-8883 TO LISTEN TO A DETAILED OVERVIEW OF THE PROGRAM. 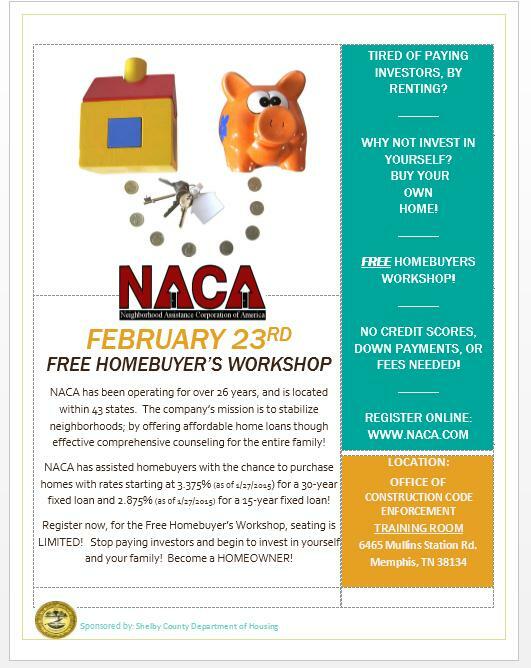 The Shelby County Department of Housing, in partnership with NACA (a local non-profit housing agency), will conduct a Home ownership Workshop on February 23, 2015. Shelby County Trustee David Lenoir has announced the next Shelby County Real Estate Road Show to promote the Shelby County’s Tax Sale and Land Bank will be Tuesday, March 18. The event will be held at the Germantown Great Hall, 1900 S. Germantown Pkwy. Check-in will begin at 1:30 p.m. with the two-hour program starting at 2 p.m.
Real estate data firm Chandler Reports is sponsoring the Real Estate Road Show and providing refreshments. Attendance is free, however advanced registration is encouraged since space is limited. Representatives from the Chancery Court Clerk & Master’s office, as well as a title attorney from the Trustee’s office, will be available to answer questions. A Land Bank representative also will discuss how to buy county-owned property and navigate its user-friendly online search tool. Shelby County’s Department of Housing will outline funds available for down payment assistance and residential renovation. Tax sales are held by the Shelby County Chancery Court Clerk & Master’s office with management support from the Trustee’s office. The county conducts four tax sales a year traditionally held at 160 N. Main. However, the next two County Tax Sales will be held at Memphis City Hall, 125 N. Main due to renovations at the County Administration Building. The next tax sale is scheduled for April 9. To register for the event, go to www.shelbycountytrustee.com and click on the “Real Estate Road Show” item under “Events.” Updates also will be posted on the Trustee’s Facebook page and Twitter at #ShelbyRoadShow.